SAN DIEGO, CA (July 21, 2018) – David and Maria Lapham, the creative legends behind the long-running, Eisner Award-winning comic book series Stray Bullets, bring Lodger, a brutal psychological thriller, to Black Crown, IDW’s creator-owned imprint for fiercely independent voices. 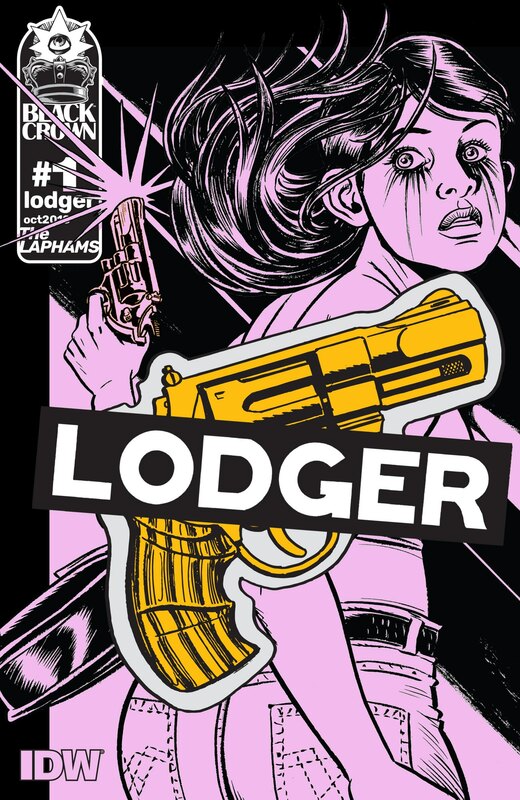 Debuting in October, Lodger is a pulse-pounding game of cat-and-mouse through roadside America between a vengeful young woman and the serial killer who ruined her life. Lodger follows a handsome drifter who murders his way through the Midwest while hiding in plain sight as a travel blogger using the alias “Lodger.” With an almost supernatural ability to change appearance, he leaves families in shreds and body bags in his wake. He’s pursued across the country by Ricky Toledo, a teenager who fell hard for the mysterious stranger years ago when he rented a small room in her home – right before he killed her mother and framed her father. Cutting right into the broken soul of America, Lodger joins Black Crown’s expanding library of celebrated, creator-owned titles including: Kid Lobotomy by Peter Milligan and Tess Fowler, Assassinistas by Tini Howard and Gilbert Hernandez, Punks Not Dead by David Barnett and Martin Simmonds, Euthanauts by Tini Howard and Nick Robles, House Amok by Christopher Sebela and Shawn McManus, and the anthology series Black Crown Quarterly.